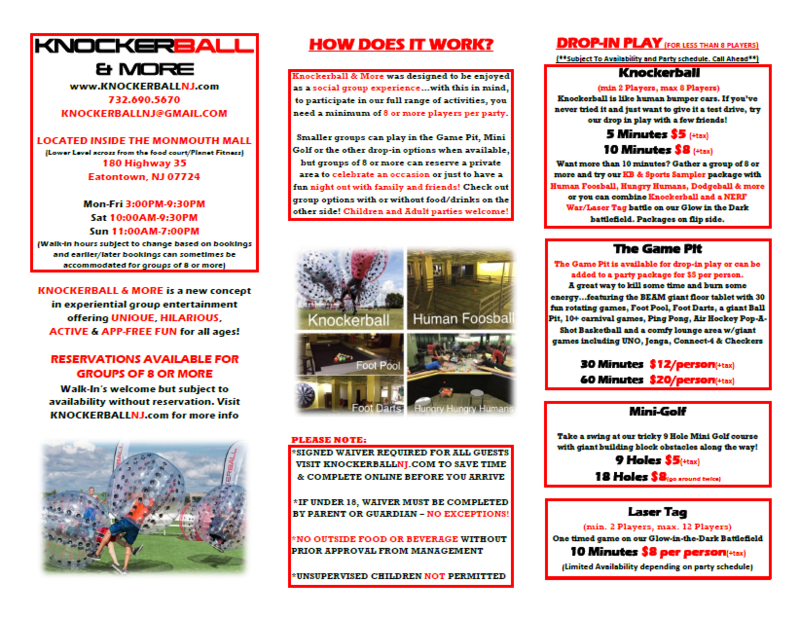 Knockerball & More is a new concept in experiential group entertainment! Our 18,000 square foot indoor family entertainment center is located inside and on the lower level of the Monmouth Mall in Eatontown NJ directly below the AMC Movie Theater and minutes from popular Jersey Shore towns including Long Branch, Asbury Park and Sandy Hook! 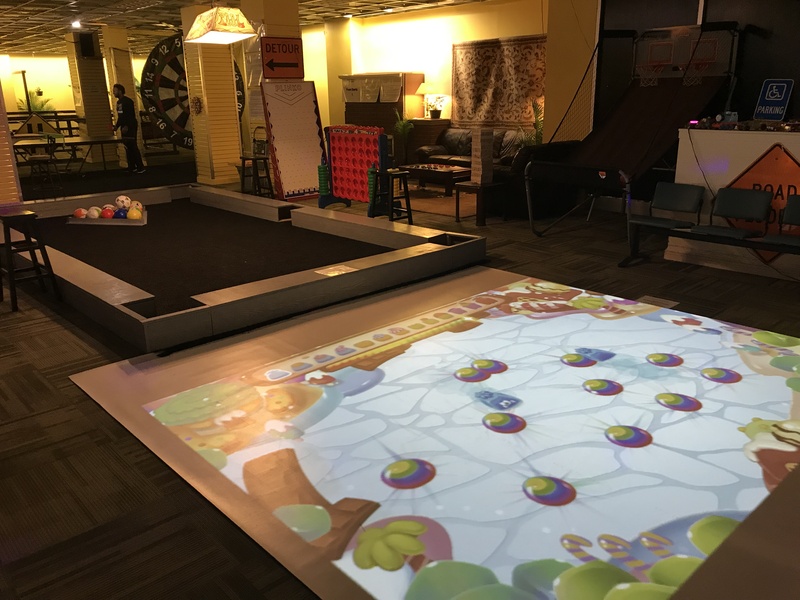 Primarily designed with groups in mind, we offer a variety of unique and hilarious activities and games for kids as young as 3, adults as old as 83 and everyone in between! 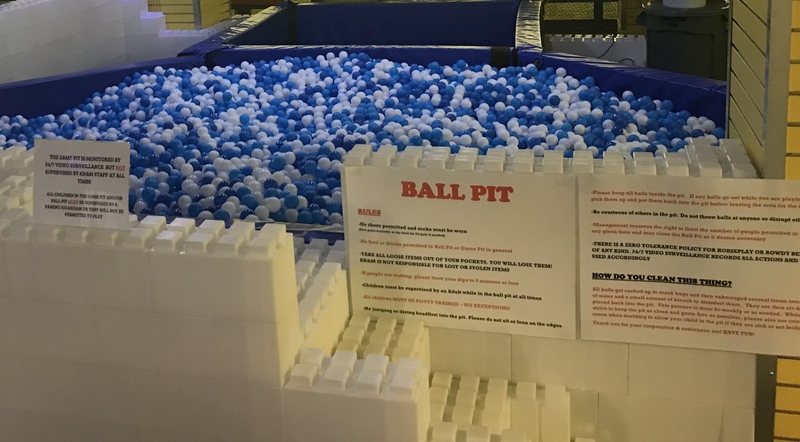 Whether you want to try Bubble Soccer (Knockerball), Human Foosball, Hungry Hungry Humans, Dodgeball, Laser Tag, NERF Wars, take a dip in the Ball Pit or much more, your experience at Knockerball & More is sure to deliver lots of laughs, great videos and even greater memories! We offer two different group packages for groups of 8 or more which can be reserved in advance for only $1 on a valid credit card. Knockeball and Hungry Hungry Humans are included with both packages. 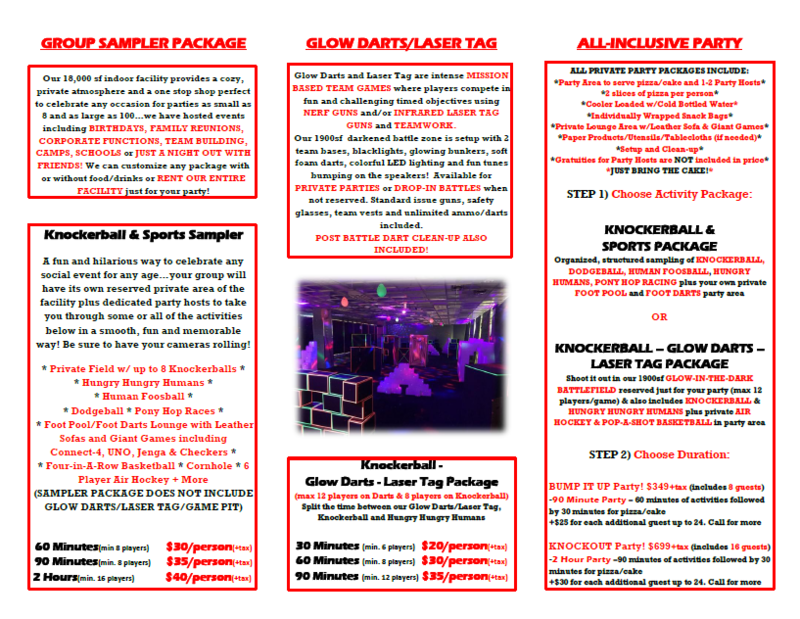 Our Knockerball & Sports Sampler Package or our Knockerball/Glow Darts (NERF)/Laser Tag Package can both be reserved for 60 or 90 minutes (2 Hours for groups of 16 or more). Group packages are all private rentals and include your own private party and lounge area for the full party with no other children or customers allowed in your section or playing games with your group. 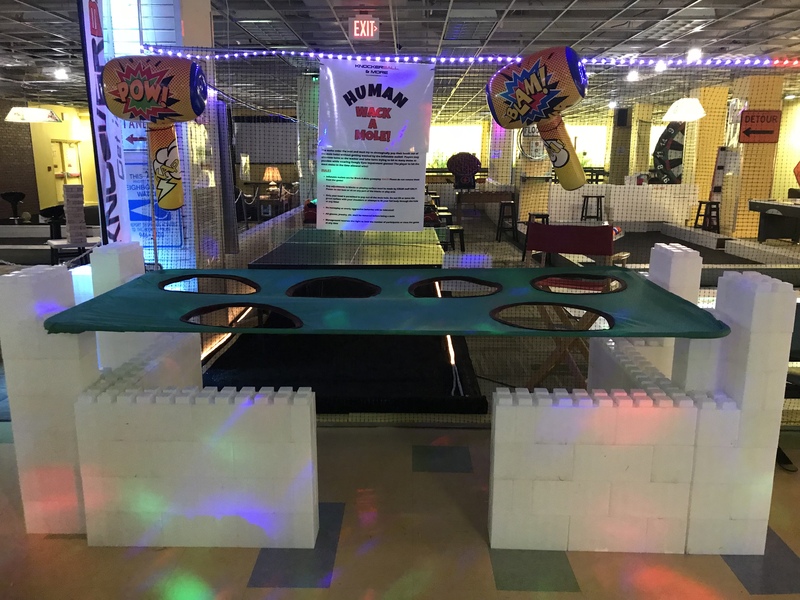 Your section also includes lifesize games including Jenga, Connect-4, UNO and Checkers as well as personal party hosts to take you through all the activities and ref the games. DO YOU OFFER KID'S BIRTHDAY PARTY OPTIONS? I DON'T HAVE 8 PEOPLE OR A RESERVATION. CAN I STILL PLAY? 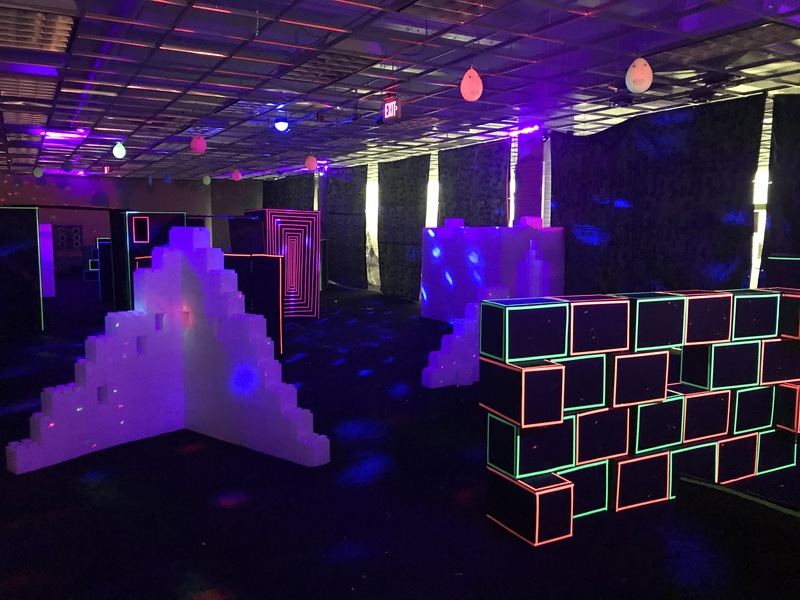 If you are looking to come for drop-in play with a smaller group or without a reservation, please call ahead especially on weekends as Knockerball, Laser Tag and NERF drop-in availability are all dependent on the private party schedule and may not have any availability at all. When available, Knockerball is $5 for 5 minutes or $8 for 10 minutes to give it a test drive for individual players. Drop-in Laser Tag or NERF is $8 for approximately 10 minutes of play. Games like Human Foosball, Hungry Humans and Dodgeball require larger groups to play but are available for drop-in play with enough players. Scroll down to our pricing brochure to see all drop-in options! 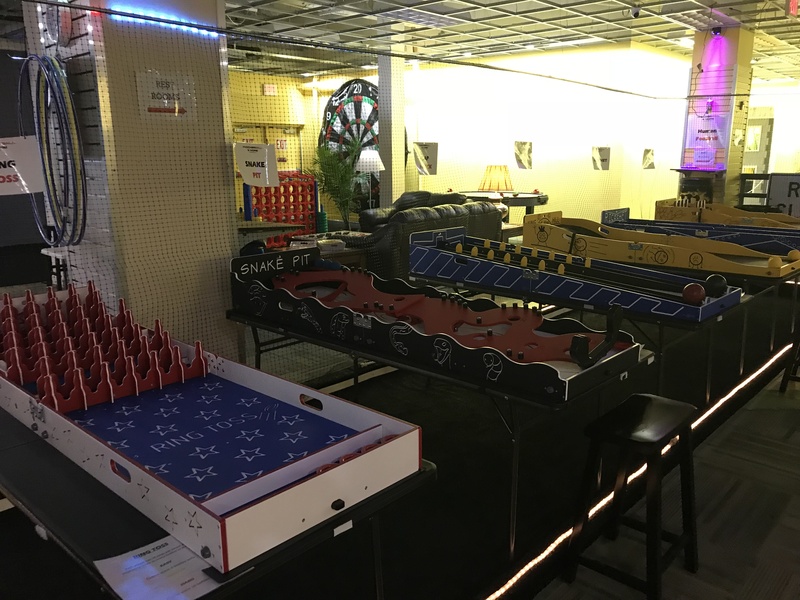 -Foot Darts * Foot Pool * Air Hockey * Ping Pong * Lifesize Floor Tablet with 30 rotating games * Ball Pit with Basketball Hoop * Lifesize Games including Operation, Connect-4, JENGA, UNO, Checkers * Carnival Skill Games * Pop-a-Shot Basketball * Foosball * MORE! Great to kill a little time before or after a movie or a fun date night activity! Scroll down below to view our full scanned in pricing brochure including group package options and drop-in options (Pinch to zoom on smart phones). INTERESTED IN CHILDRENS BIRTHDAY PARTY PACKAGES? Choose one of our group packages with a minimum of 8 players below or select an All -Inclusive package with pizza, bottled water, snacks and more - reserve your slot online for only $1 on a credit card today! 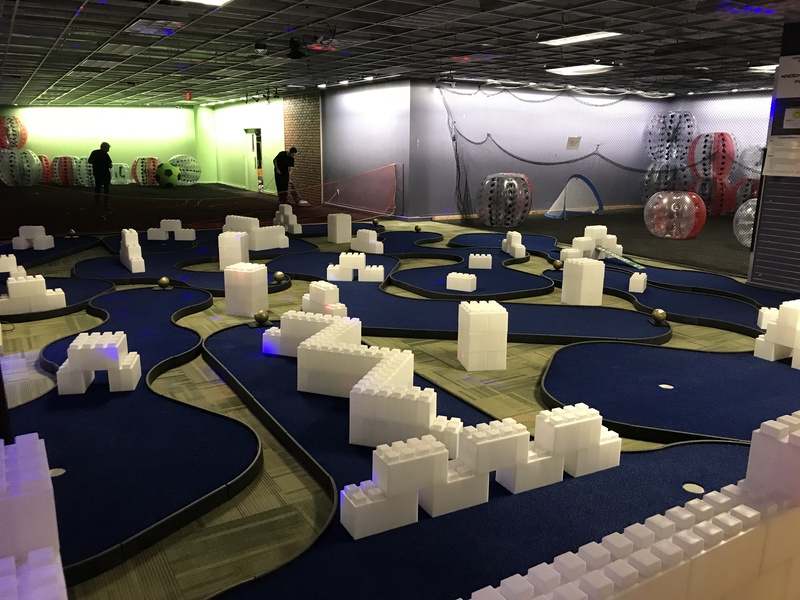 Try some or all of the activities below in an organized private setting with just your own group of friends and family playing - no other customers mixed in! Our party hosts will take your group through each activity and keep the fun coming and the party moving smoothly! 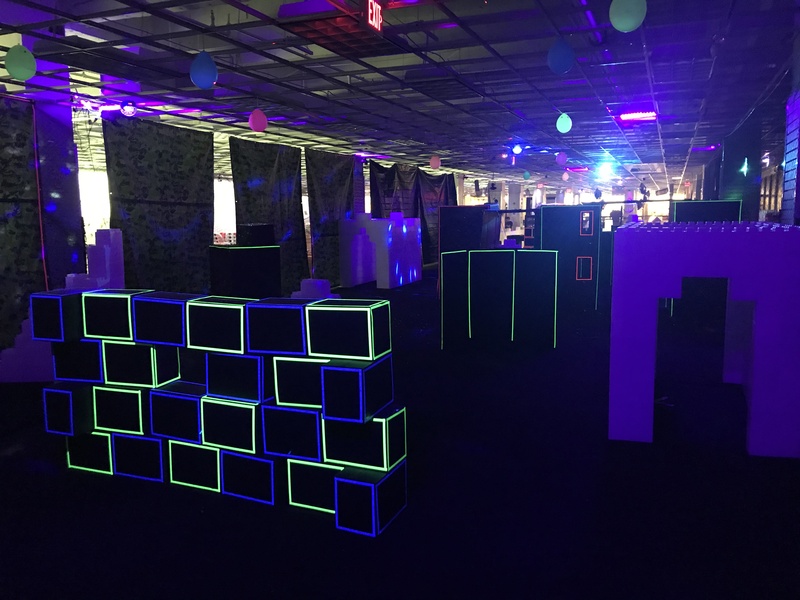 Reserve our 1900sf Glow-in-the-Dark battle zone exclusively for your group - complete with 2 bases, blacklights, glowing bunkers, glow-in the dark soft foam darts, colorful LED lighting, interactive light targets and fun tunes bumping on the speakers! 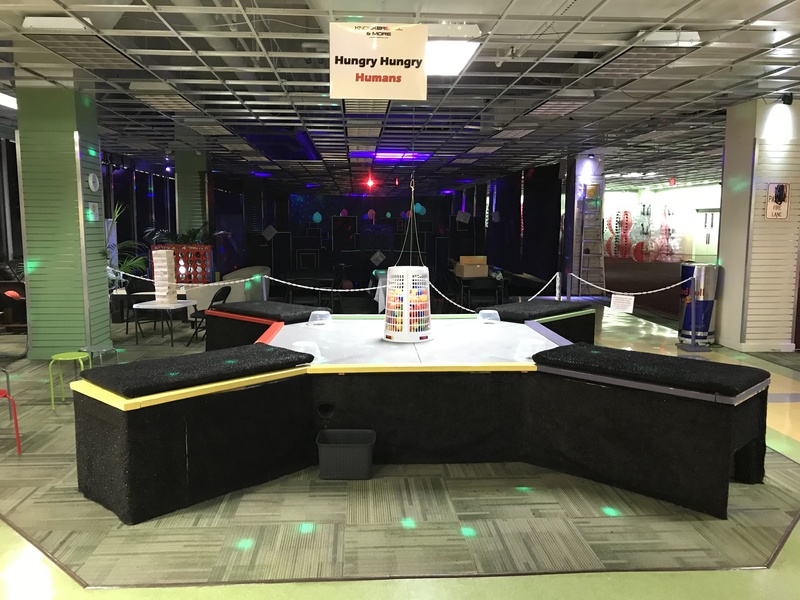 Play a combination of basic elimination Laser Tag, Nerf Wars and Knockerball plus try Hungry Hungry Humans and 9-Hole Mini Golf too! Your rental also includes a private lounge area with sofa, Air Hockey, Pop-A-Shot Basketball and Lifesize Games Jenga, Connect-4, UNO and Checkers! Available for PRIVATE PARTIES or DROP-IN BATTLE when not reserved. POST BATTLE DART CLEAN-UP ALSO INCLUDED! Choose between the Knockerball & Sports Package or Knockerball/NERF/Laser Tag package to celebrate a birthday or any other occasion including food, drinks, snacks,paper products and more! ARE YOU A CHILD IN AN ADULTS BODY? THROW YOURSELF A KIDULT BIRTHDAY PARTY! Find Cool Things to do in NJ!